ABRASIFLEX specialises in the wholesale, retail distribution, and sale of a comprehensive range of industrial abrasives including both bonded and coated products. ABRASIFLEX is well represented through their extensive operating network throughout Australia and South-East Asia to offer “off the shelf” deliveries of their complete range of Industrial Abrasives. As industry leading specialists, ABRASIFLEX employs respected technical and practical people who are committed and available to recommend applications and provide assistance relating to operational issues. ABRASIFLEX Pty Ltd is an operated company that was established in July, 1975, and has been purchased in 2007 by CIL Group. The head office along with its main warehouse is located in Welshpool, Western Australia. ABRASIFLEX also has extensive representation along the eastern state through offices and warehouses in Adelaide – South Australia, Melbourne – Victoria, Sydney and Newcastle – New South Wales and Brisbane – Queensland. Since 1972, Workforce Clothing has maintained a proud association with a number of Australia’s leading mining, construction, and infrastructure companies as a supplier of choice for Quality Industrial Work Clothing. Based in Welshpool, Western Australia, the responsive team are able to achieve consistently high levels of service to meet diverse requirements. Privately owned by CIL Group, Workforce Clothing brings a “family feel” to this corporate supply environment. The success stems from the values that this company was founded on: Providing quality products and outstanding services, all at a competitive price. Caddy Industrial Sales is West Australias largest supplier of Construction Support Systems. Electrical, Mechanical, Fire and Pipe Support Systems. We also offer an extensive range of air-conditioning duct hardware. With a product range that includes Caddy Cable Tray and Cable Ladder, Caddy Mechanical & Electrical Support Systems, Smoothflo Duct Hardware, Lindapter Clamping System & Sikla Pipe Support Systems, the company is West Australian owned with quality of service assured every time. “Deliver a Quality Construction Support System on Time on Budget”. Strapping is the process of applying a strap to an item to combine, hold, reinforce, or fasten it. Strapping is commonly used in the packaging industry. Steel is the oldest and highest tensile strength strapping. It is available in a variety of widths and thicknesses as well as variations in the grade of steel. Steel is used for heavy duty holding where high strength and minimal stretch are desired. Surface finishes or steel strap include: paint, paint and wax, bluing or zinc and wax. The wax is used to better transmit the tension around the bundle and for use with certain types of tensioners. Common applications include steel coils, bundles of metal, and roll end-binding. After the strap is tensioned, the strap is often sealed to itself. Steel strap is sealed with a seal and notch joint, a seal and crimp, seal-less joint. Seals come in various shapes depending on the application. Some can be put on after the strap is tensioned, while others must be installed before tensioning. To create the seal, the seal and strap are notched on both sides. A set of notches are often called a double notch joint. Crimp joints also use a seal, but crimp undulations are used instead of formed notches. These crimps form great frictional forces which keep the joint from seeping. Strapping machines, also known as bundlers, are used for high volume applications or special applications. They are available in horizontal and vertical orientations, however the vertical orientation is far more common. They are also available in bottom seal, side seal, and top seal orientations, which define where the joint is located on the bundle. They are available in semi-automatic and automatic varieties. The automatic versions are designed to be used in line with conveyor systems. 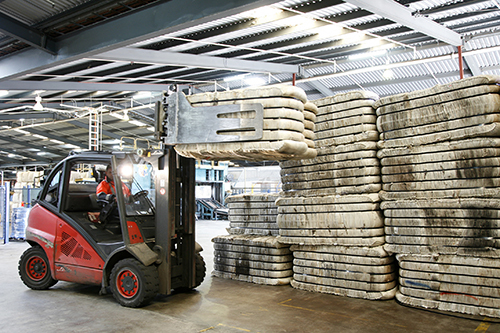 A photo eye is used to detect when the bundle is in the correct location, stop the conveyors, and activate the strapping machine.